Set in an idyllic winter wonderland, the Mountain Hill Cabin is a skier’s fantasy. Designed by Fantastic Norway architects, the private cabin’s gabled roof is set at such an angle that the clients can ski right over and down it! Part cozy mountain lodge, and part ski slope, the cabin provides both a place to stay and a source of entertainment for its residents. 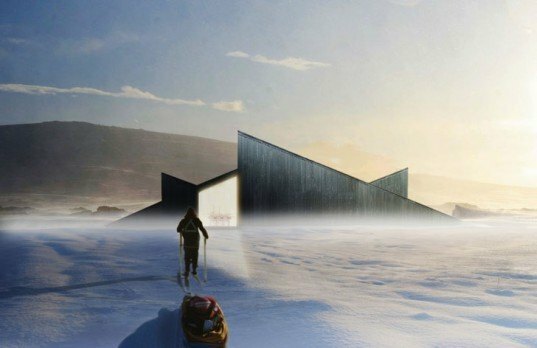 Designed for a remote area in the mountains of Ål, Norway, the snowy retreat will be only reachable by skis in the winter. The site is nestled deep within the mountains, where skiing is a serious sport for the most dedicated outdoor enthusiasts. The client initially came up with the idea to use the roof of the cabin as a slope, which could be used for skiing, sledding and winter play. In order to integrate the roof with the surrounding landscape, Fantastic Norway set the gables at 23 degrees. The eaves are lengthened, creating a smooth and continuous track to ski or sled upon. With the angular slopes, the cabin takes on a triangular shape. Two bedrooms and a living room area are located on the first floor, and an additional bedroom caps off the smaller second floor. Large sun-facing windows peek out from the rooftops, flooding the interiors with light. 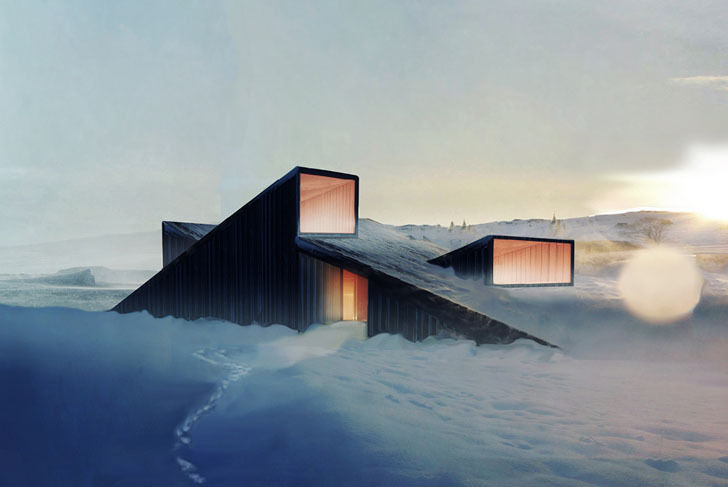 The cabin is designed to integrate with the landscape, so that both snow and wind can slip gently over it, rather than beating against the structure. The walls will be specially insulated to ensure a warm place to rest after a day of skiing in freezing temperatures. The building materials will be brought to the site via snow scooter out of respect for the natural beauty of the region – this way larger vehicles will not disrupt the terrain of the mountainous landscape. Construction for Mountain Hill will being in Summer of 2012.